A 14th century Scottish castle has finally gone to a mystery American buyer after a failed attempt to auction it online. The new owner of Lee Castle in Lanark, South Lanarkshire, has also bought a feudal barony and now has a portfolio of 261 acres of land. Estate agents Re/Max Clydesdale declined to confirm the selling price or who the new owner might be. But it is thought the castle was sold for less than the $8.5m fixed price. The castle website's only reference to the sale is the simple message: "Best wishes to the 35th Baron of Lee." 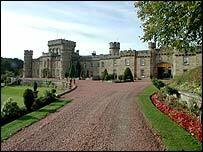 Last November the 30,000sq ft castle sparked a bidding frenzy when it was put up for sale on its official website, www.leecastle.com. It attracted more than two million hits but the auction fell through due to bogus bidders. Reports claimed interest from Hollywood star John Travolta, a wealthy French duchess and a self-proclaimed website entrepreneur. Ten bids were entered during an eBay auction, which closed in April with a top offer of $9.7m - but the reserve price was not met and the agents elected not to go through with the sale. Since then it has been marketed in the UK and extensively in America. Due to the different pricing structures on both sides of the Atlantic, it was advertised in the UK at offers over £5m and in the US for a fixed price of $8.5m. The 700-year-old castle, which lies in the Clyde Valley, comes fully furnished with all its historic and antique contents and heirlooms. It also boasts two lodge houses, a banqueting hall, grand ballroom, 14 bedrooms and heated swimming pool. The new owner will assume an ancient noble title and become 35th Baron of Lee, following a proclamation by the Lord Lyon King of Arms in Edinburgh. The Barony even comes with its own 25-member band, The Pipes and Drums of The Barony of Lee. The original lands of Lee were granted to William Locard, circa 1272, and lay between Lanark and Carluke on the north side of the Clyde. 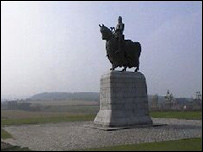 Robert the Bruce is reputed to have signed a charter under the branches of the Pease Tree, an ancient oak in front of the house, while, three centuries later, Oliver Cromwell is said to have dined at the same spot.